April 7, 2017 – Astronomers using NASA’s Kepler space telescope have found a planet 219 light-years away that seems to be a close relative to Venus. This newly discovered world is only slightly larger than Earth, and orbits a low-temperature star called Kepler-1649 that’s one-fifth the diameter of our Sun. 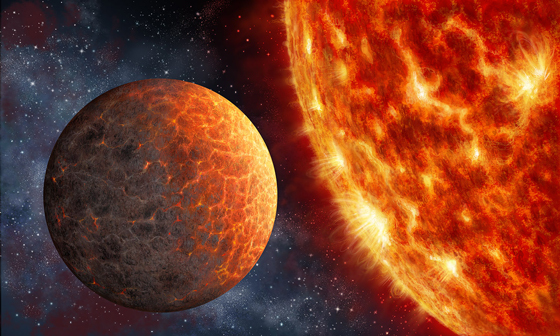 It’s said that Venus is Earth’s sister planet, but in many ways it’s not a close sibling. Despite being the same size as Earth, and only 40 percent closer to the Sun, its atmosphere and surface temperature are wildly different from our own. Ames manages Kepler and its follow-on K2 mission for NASA’s Science Mission Directorate. JPL managed Kepler mission development. Ball Aerospace & Technologies Corporation operates the flight system with support from the Laboratory for Atmospheric and Space Physics at the University of Colorado in Boulder.